Oh my goodness, has it really been that long since I last updated? I can explain. First it was down to nothing but my own laziness/busy-ness. Then it was because I started going gliding again for the first time since 2008, and as a result of that, I met a guy, moved to Shakespeare’s County with him and now never have the time to update! I went to Rome back in September for a long weekend with my mum, which was really nice. It’s a bit of a tradition of ours, and it’s nice because we’re both interested in the same sort of stuff – especially the traces of very early Christianity that are all over the city if you know where to look. I stayed an extra night on my own and met up with a friend of mine, who just happened to be in Rome with a friend of hers that night. We went out for a fab meal at Da Baffetto in the evening, and the next day I took them on a bit of a tour (my friend’s friend had never been to Rome would you believe!). We discovered the most fantastic place for lunch: Obika, a mozzarella bar! 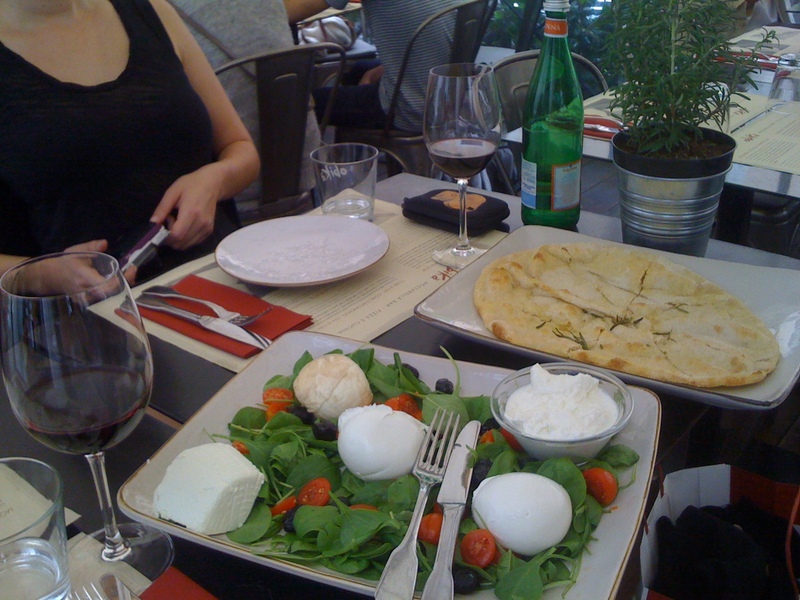 It was absolutely amazing – I had no idea that there were so many different kinds of mozzarella. They bring out a massive platter of all the varieties, along with some tomatoes, bread, olive oil and balsamic vinegar, and let me tell you, it is the food of the gods. There are branches of Obika in other countries if you can’t make it to Rome, but it’s definitely something that you should put on your bucket list if you’re at all interested in cheese. In December Lee and I had our first trip abroad together – a nice Christmassy weekend in France. 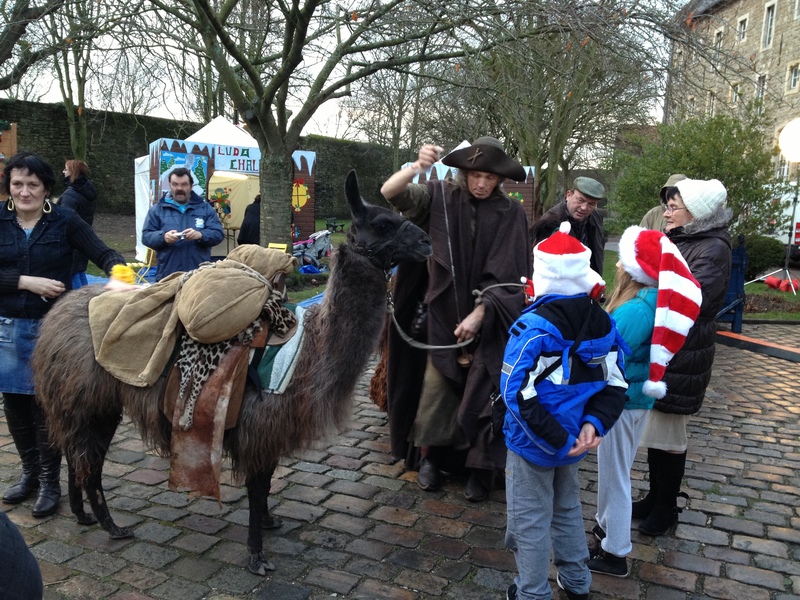 We went to Boulogne and stocked up on French food and wine, wandered around a Christmas market (at which there were, inexplicably, llamas), treated ourselves to mouthwatering steak at a lovely restaurant in the square, and went in the cathedral. It’s surprisingly do-able in a weekend and if you get Eurotunnel tickets, an overnight trip is only about £30 each way. We returned to France again in April, stopping overnight in Boulogne en route to Bruges, where we spent a delightful sunny day. I had been to Belgium once before, but just passing through on the way to Germany with my grandparents many years ago, so there hadn’t been time to take in the cultural differences then. From the moment we parked the car I was struck by how neat and tidy everything was – the carpark at the station was pristine and there was a massive secure room absolutely full to the brim with bikes. The historic centre of the city is conveniently signposted for tourists arriving by train, so we had a leisurely walk through a park and then spent much of the day wandering the city’s meandering streets. The number of chocolate shops was quite amazing, and inevitably we spent quite a few Euros on stuff to take back. 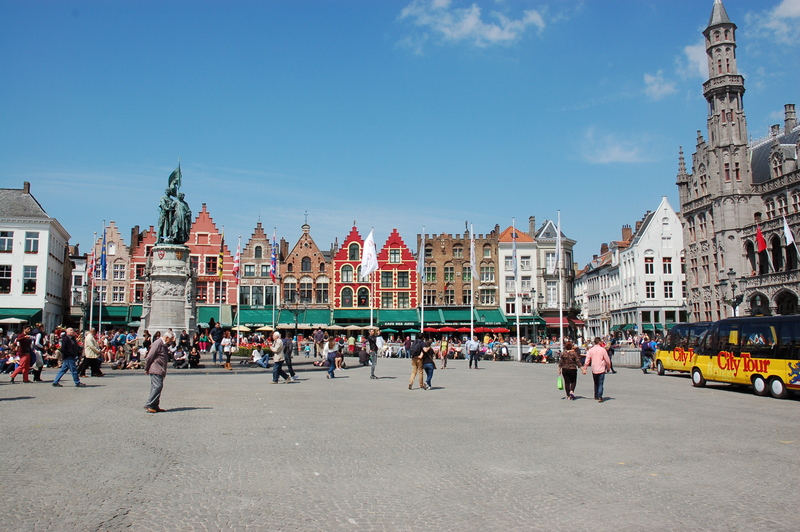 I hadn’t realised that Bruges has lots of canals, a bit like Venice, and there was a nice little market set up along the banks of one, where we indulged in waffles purely because we were in Belgium. We ended up sitting outside in the main square watching the world (and a marching band) go by. All we could just about afford in the extortionately priced restaurants was a ham sandwich to share, a giant beer for Lee and a glass of red wine for me. Needless to say, I came away sunburnt, but it was a glorious day. Next weekend we are off to Scandinavia, which will be my first trip to that part of the world, though Lee has been before. We are going to Copenhagen for the day on Friday, before crossing the bridge into Sweden for the rest of the weekend, where we are attending the wedding of my dear friends Hanna and David in a village not far from Lund. It should be amazing, though I’m not really looking forward to a 3am start on Friday! The next trip we have booked after that is a weekend in Rome to celebrate our anniversary in October. I can’t wait to show Lee around my favourite city and introduce him to all the best gelaterias! I was surprised by how much the price of flights has gone up since I last went. In the end though we got a good deal with Monarch, which I discovered via cheapflights.co.uk. We’ll be staying in my usual B&B, which is five minutes’ walk from St Peter’s, so that’ll be lovely. Our last trip of the year will be to Tunisia for a week in November. We booked through Thomas Cook so I’m not expecting five-star luxury, but it will be a great opportunity to experience a completely different culture from anything we’ve ever experienced before. And I’m told we can ride camels on the beach, which itself is reason enough to go. Sorry for neglecting the blog of late. I have been insanely busy! I thought I’d share an interview I did with Wandering Educators a while back – better late than never – and I’ll be back with more great Rome features in the New Year! I took 5 years of Latin in high school. It wasn’t enough for me – I couldn’t learn enough about Rome, Italy, languages, and food (well, you know me). So, I am drawn to all things Rome – past, present, and future. From Romulus and Remus to Gelato, I am all in. 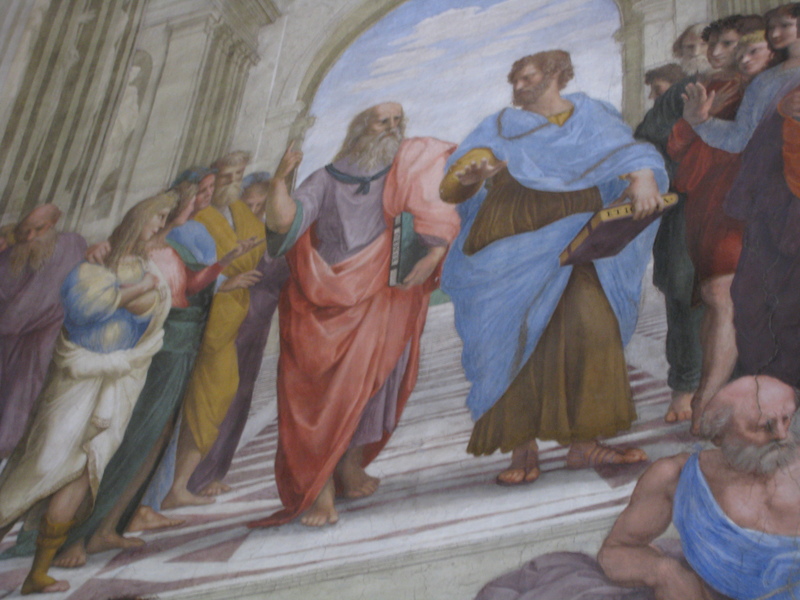 So imagine my delight when I found a website ALL ABOUT ROME – for thinking people! 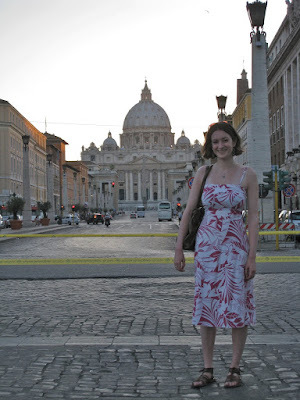 Rachel’s Rome Writings, by Rachel McCombie, is more than a travelogue – it’s a resorce for learning about Rome – places, spaces, walks, food, and more. You can read about the Tomb of Eurysaces, the top Rome attractions, archaeology, churches, places to stay, the Seven Hills of Rome. It’s so much fun to dig into this site and explore. AND! Rachel is our NEW Rome Editor, so look for more great articles from her – both on our site, and hers. Her latest here? 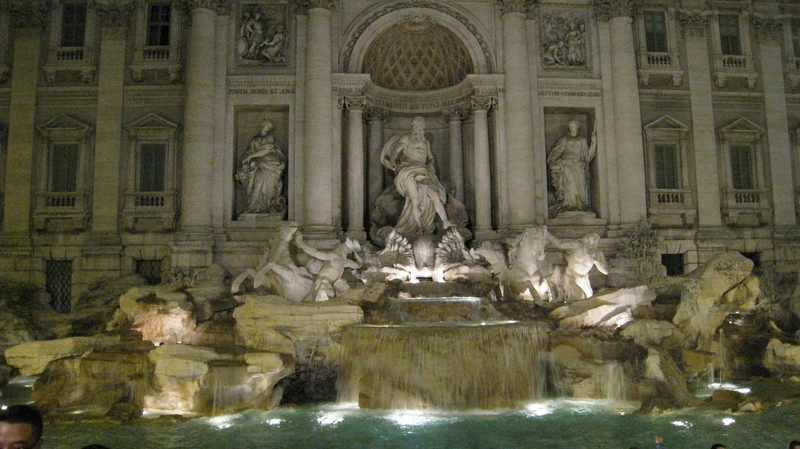 Rome’s Trevi Fountain – understanding the rituals. Love it! WE: How did you get to love Rome? RM: It all started when I was at university. I studied Classical Archaeology and Ancient History, meaning I got to study both ancient writings and the surviving monuments. In my second year, one of my many amazing tutors told me about a summer school which is held every year at the British School at Rome, and I decided to apply. I’d been to Rome before, but this was a lot more intense – site visits all day every day, with lectures in the evening. It was the best two weeks of my life, and I really got to know and love the city. I’ve been going back regularly ever since! RM: I’ve always kept a journal and I loved reading back over what I’d written on the trips I’d made to Rome. Since the thoughts I’d jotted down weren’t really that private, I thought it would be nice to start a blog and share my experiences with the world! It started off as just a transcript of some of my travel journals, but it’s a lot more varied now, with posts ranging from history lessons to wine bar reviews. I’ve also taken thousands of photos of Rome during my time there, so it’s a great way of sharing those, too. WE: How can travelers best plan a journey to Rome? RM: Don’t go in July or August! It’s unbearably hot. October is my favourite time of year to go, as the weather is on the hotter side of warm without being stifling. I’d definitely recommend finding a hotel or B&B that’s as close to the historical centre as possible – not only is the atmosphere better, but it means you waste a lot less time on public transport! The centre of Rome is small enough that you can get around on foot to see all the main sights. As for planning what to see, it depends on your interests really. Rome is bursting with archaeology, museums, interesting churches, and of course shops and restaurants, so I’d recommend investing in a good guidebook – I like the Eyewitness Guide to Rome – and seeing what takes your fancy. WE: What are your favorite off-the-beaten path places to see in Rome? RM: Some of the smaller churches are wonderful, I think. The Caelian Hill – sort of behind the Colosseum – has several amazing churches which hardly any tourists seem to know about. Santi Quattro Coronati is a favourite, particularly if you get to hear its resident nuns singing, and it has a stunning chapel with scenes depicting the conversion of Constantine. 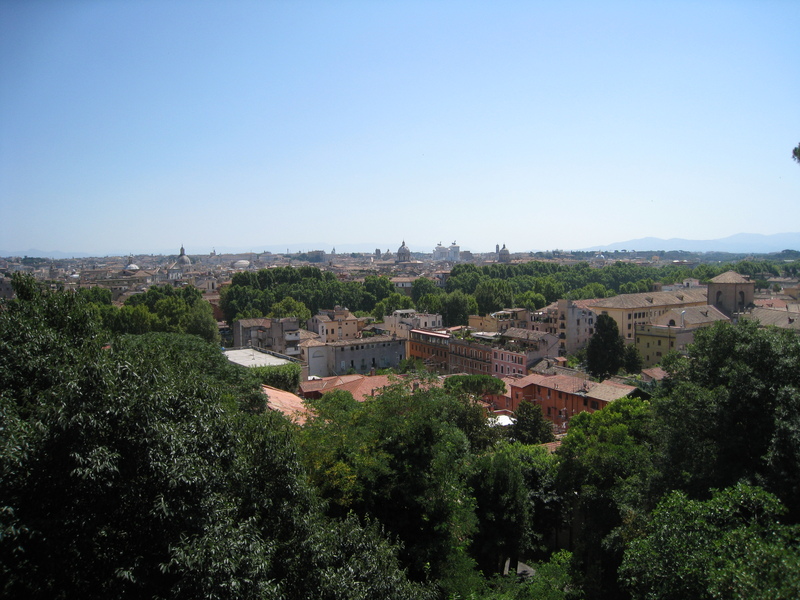 I’d also recommend the Janiculum Hill, which is on the Vatican side of the river – the views from there are incredible. WE:How can travelers best live like locals in Rome? RM: Perhaps try renting an apartment from somewhere like Holiday Rentals. Make sure you visit an Italian supermarket – the food is great and the wine is cheap. Alternatively, go to the Testaccio market, where there’s an abundance of delicious local produce. If you want to dine out, try Trastevere, over the river – it has some of the best trattorias, and an energetic atmosphere for a night out. Try tonnarelli cacio e pepe – a pasta dish with pecorino cheese and black pepper. It’s a Roman speciality, and so simple but so delicious. WE: What are your top Rome travel tips? RM: Don’t try to do too much, because you won’t be able to fit everything in. And don’t worry about getting lost in the maze of back streets – you see more by getting lost! Finally, don’t waste too much time queuing. If you turn up at the Vatican and the queue goes right the way round the piazza, don’t bother – just go back at around 6.30pm and you’re likely to get straight in. For the Colosseum, buy a ticket at the Forum Romanum first thing in the morning, and that’ll let you skip the queues (it’s a combined ticket for the Forum, Palatine Hill and Colosseum). Don’t get drawn in by the numerous tour guides who’ll harass you outside, and don’t photograph the men dressed as gladiators unless you’re prepared to cough up around €5. WE: Is there anything else you’d like to share with us? RM: I’d like to share this photo that I took of the Via Baccina in Rome because it summarises what I love about Rome. Quiet backstreets with tall, ochre-coloured buildings with loads of shutters, and remarkable archaeology lying unexpectedly around every corner. 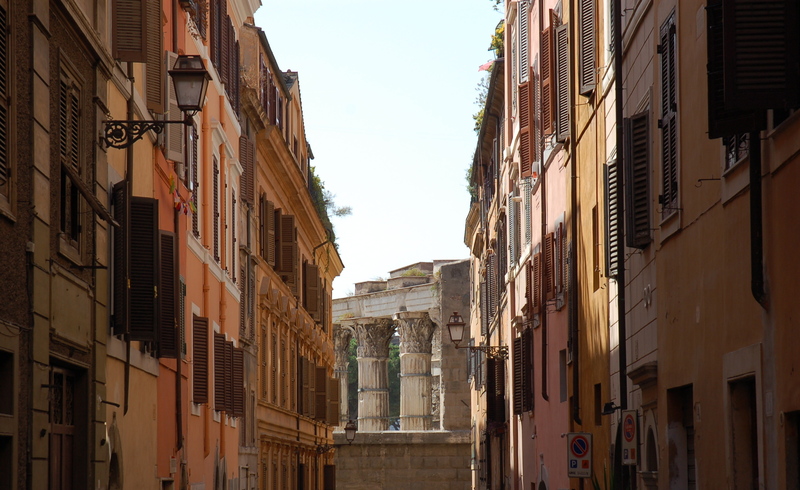 That’s the Temple of Mars Ultor at the end of the street, built by Augustus in his forum. It’s just absolutely amazing to be able to walk down a modern street and see the same columns that Augustus would have seen. I recently became the Rome Editor for a lovely travel site called Wandering Educators, and for my first post I decided to write about the Trevi Fountain. It’s one of Rome’s most popular landmarks, so I thought it would be interesting to delve a bit deeper, as it were, and look at the history behind the tradition of throwing a coin in. You can read the post here if you’re interested: Rome’s Trevi Fountain: Understanding the Rituals. Another Rachel’s Rome Writings post coming soon! 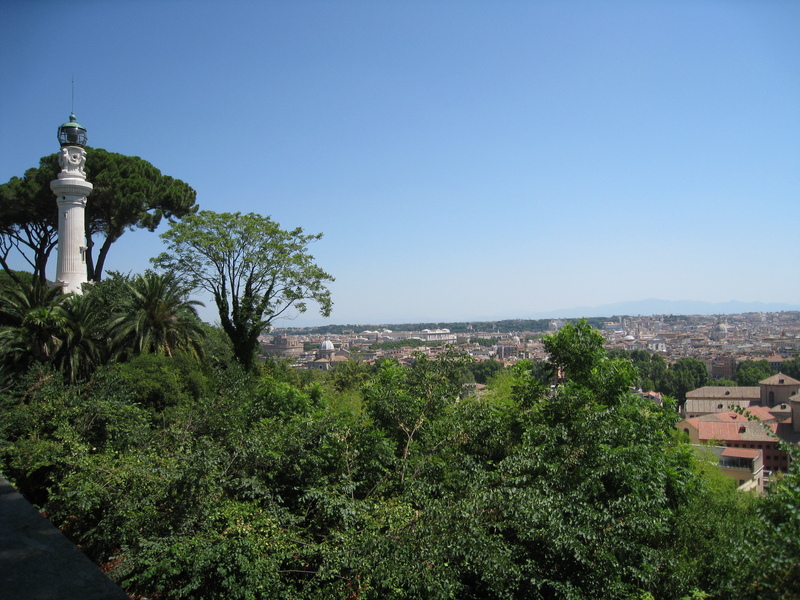 I had been to Rome eight times before I discovered the gem that is the Janiculum Hill. Of course, I’d heard of it and knew where it was; you may remember my post on the Seven Hills of Rome, of which, as I noted, the Janiculum is not one. But somehow I’d never got round to exploring it, and one stiflingly hot day this July, I finally did. I have to say, I owe my discovery of this peaceful part of Rome to my dad, who decided it would be a good place to go for a walk on our last morning in Rome. Admittedly I was a little unwilling on account of the heat, and I definitely would have got more out of it had the temperatures been more comfortable (the sun was beating down and temperatures were soaring into the mid-thirties – so high that even the lizards seemed to have sought refuge, for there were none in sight). However, we got a good sense of this part of Rome and it’s somewhere I’ll definitely return to at a milder time of year. 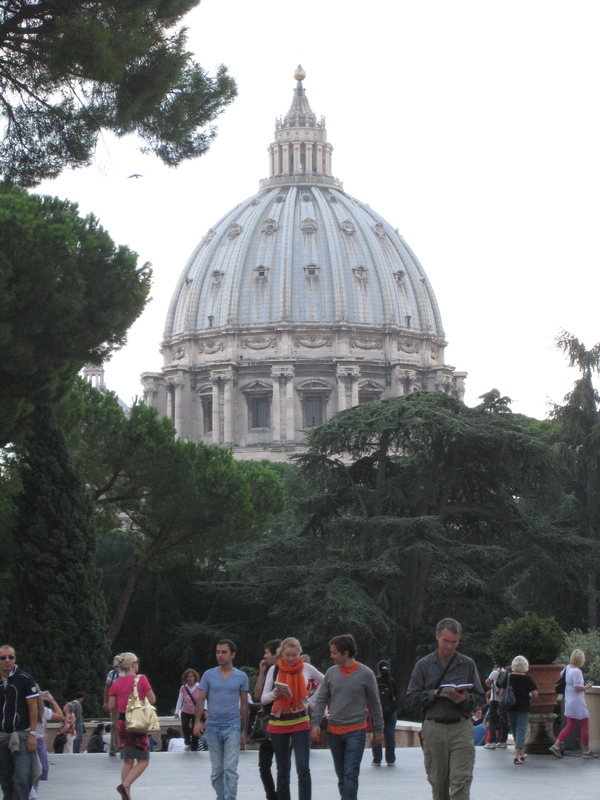 We approached the hill from the Vatican, via a series of steps set not far back from the Tiber. They’re not continuous all the way up, rising instead in stages, and at each new level the view of Rome gets better. Once you’re at the top, you are met with a stunning panorama of the city of Rome, and you instantly get a sense of how Rome sits within the mountainous landscape beyond. The immediate view encompasses Castel Sant’Angelo to the left, the Pantheon straight ahead and Trastevere down to the far right. As usual, the most eye-catching monument from this distance is the gleaming white Vittorio Emmanuele Monument, which dwarfs the surrounding buildings. I was surprised to have some difficulty in locating the whereabouts of the Colosseum, which, though it seems vast when you’re standing next to it, blends into the cityscape remarkably effectively. Eventually I spotted it by reference to the Vittorio Emmanuele Monument and the senate house in the Forum Romanum, the sharp diagonal line of the Colosseum’s restored wall edge giving it away. There are plenty of benches along the top of the hill which overlook this impressive vista, and I could quite happily have sat there all day admiring it. But we valiantly continued our walk in the oppressive midday heat, coming to a lighthouse which was a gift to Rome in 1911 from Italians living in Argentina, and, a little further along, the striking Garibaldi Monument, of the man himself mounted on his horse in rather a Roman way. We were somewhat taken by surprise by the sudden firing of a cannon at noon, which my dad had forgotten to warn us about. This tradition, apparently dating from 1847, was started in order to signal the exact time to Rome’s churches, so that they could start ringing the bells at the correct time at midday. Our final stop of the morning was down the slopes of the hill into the Orto Botanico, which was a tranquil oasis filled with Japanese-style water features, elegant shrubberies and a small solitary duck which had orange feet. It’s fair to say that we were pretty hungry by that point, so we didn’t spend long there – just long enough to know that it is somewhere I’ll definitely visit again. The other entrance to the Botanical Gardens is in the Trastevere quarter of Rome, and it was there that we made our exit for a much-needed lunch. I’ve just returned from a week in Rome and have lots to write about, so there will be more blog posts coming soon! 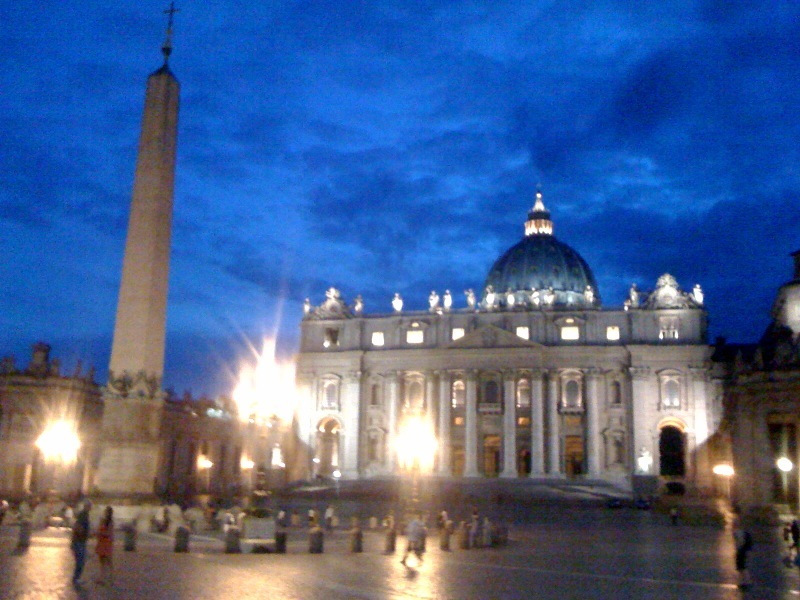 In the meantime, I thought I’d share a rather cool pic I took on my iPhone last week of St Peter’s Basilica at dusk. Night photography is difficult and I don’t have a tripod! But there will be more to follow once I get the photos off my proper camera. “Where should I go in Rome?” is a question I’m often asked by friends and acquaintances, and it’s one I actually find fairly difficult to answer because there’s just so much that I would recommend! Therefore I thought I’d aim this post at the first time Rome visitor, so that there is somewhere on this blog that I can point to for a basic overview. Here’s a checklist of the really famous tourist attractions that you really shouldn’t leave Rome without seeing – and some tips on the best times to go. Don’t worry – even if you don’t go in, it would be difficult to miss Rome’s most famous landmark, which is centrally located and not exactly hidden away. Nothing can prepare you for the vast size of this mighty Roman amphitheatre, and expect it to be seething with tourists. If you do want to go in, the ticket is combined with the Forum Romanum and the Palatine Hill (priced at €12), so buy your ticket at the Forum Romanum first thing in the morning and you’ll be able to skip the daunting queues and get straight in. The sunken garden of Domitian's Palace, on the Palatine Hill. 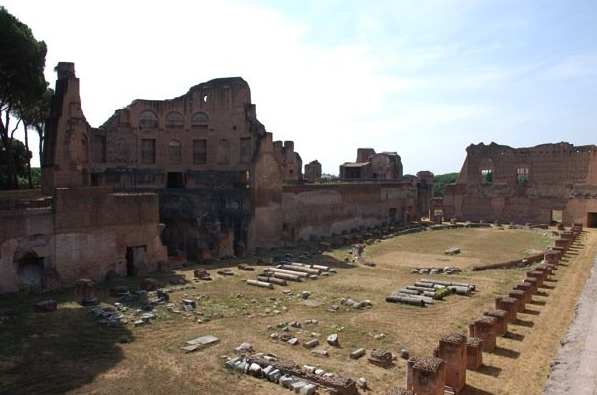 Once the seat of Rome’s emperors, and the origin of our word “palace”, the Palatine Hill is now an extensive archaeological site with commanding views of Rome and plenty of lizards. There are large areas which lack shade, so if you’re visiting in the heat of the summer it’s highly advisable to go first thing in the morning or late afternoon to avoid the worst of the heat. 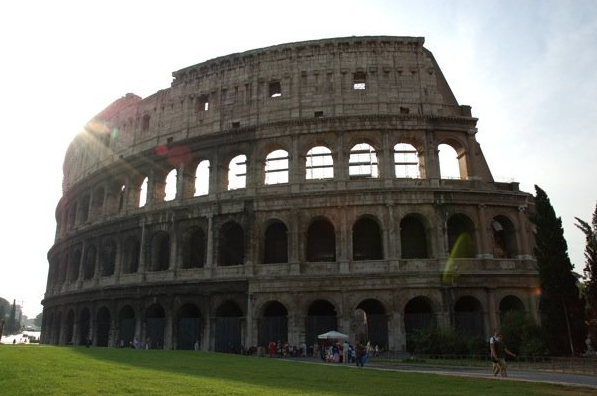 See above (the Colosseum) for Palatine Hill ticket advice. The Roman Forum seen from the Capitoline Hill. In the foreground is the Arch of Septimius Severus. 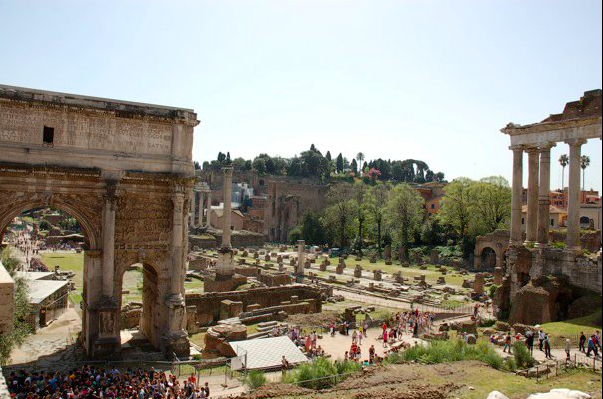 The original Roman piazza, the Forum Romanum was the heart of ancient Rome and was where administrative buildings such as law courts and archives were located. The present jumble of ruins is difficult to make sense of, so take a guide book with a good map (I recommend the Blue Guide to Rome or the Eyewitness Guide to Rome). As with the Palatine Hill, there is little if any shade, so visit early in the summer months and/or take a good sun hat! See above for ticket advice. The mighty Basilica di San Pietro is the largest Christian space in the world, and it’s always heaving with visitors. You have to go through airport-style metal detectors to get in, and if you see a queue stretching round the piazza it’s advisable to come back later in the day, when it’s likely to have died down. Visitors can appreciate the basilica’s vast proportions both from the ground and, providing they’re not scared of heights, from Michelangelo’s famous dome. There are two options for visiting the roof: on foot for €5, or by the lift for €7. However, be warned that if you chose the lift you’ll still have a fair few steps to climb to get up to the cupola for the best views of Rome. The climb is well worth it when you step out of the narrow staircase to enjoy a stunning, 360 degree view of the city. Home to one of the world’s most important collections of antiquities and art, the Vatican Museums are definitely worthy of a visit. The exhibits seem to go on for miles and it’s easy to get overwhelmed, so don’t try and see everything in one go – you won’t manage it! Instead, try and get an overview from a guidebook in advance and decide what you particularly want to see. Many visitors head straight for the celebrated Sistine Chapel, which is right at the end of the tour, so some sections of the museum can be surprisingly quiet. There are usually impressive queues to get into the museums, but lunchtime is often quieter. 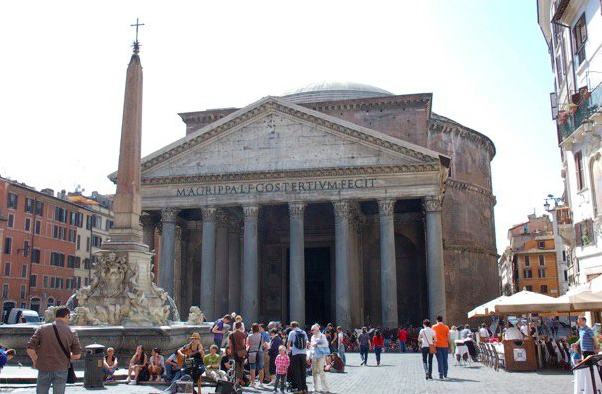 The Pantheon is the most complete structure to survive from antiquity. This Roman temple owes its incredible state of preservation to the fact that it was converted to a church, and although the trappings of modern religion have an impact on the atmosphere, it’s nonetheless an extremely impressive space. The hole (or oculus) in its vast dome is open to the elements, so the rain falls to the marble floor. Look out for the tomb of the Renaissance painter Raphael. The Trevi Fountain, surrounded by people as always. 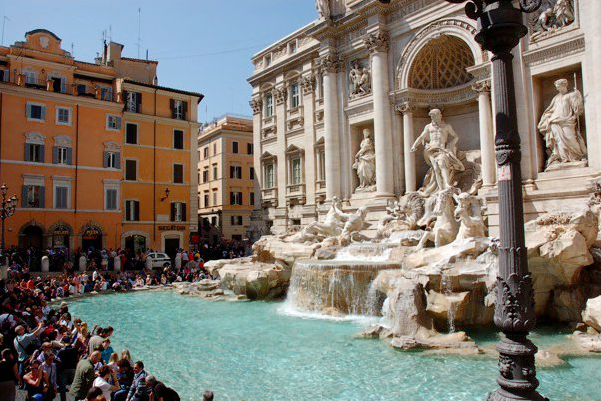 Rome’s most famous fountain – and indeed one of its most famous landmarks – is always swarming with tourists, making it difficult to negotiate the small piazza which it dominates. However, don’t let this put you off: the impact of seeing it for the first time is scarcely diminished by the crowds. Don’t forget to throw in a coin to ensure your return to Rome! 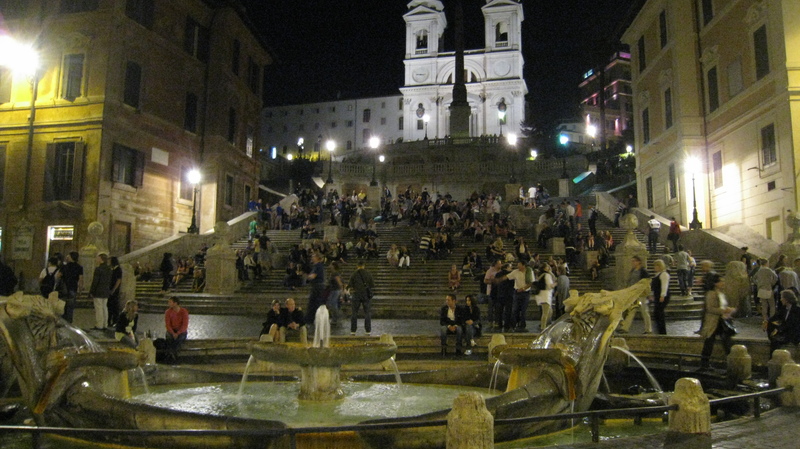 The Spanish Steps aren’t far from the Trevi Fountain, and make a great end to a day exploring Rome as they’re particularly atmospheric at dusk. If you don’t have the energy to negotiate the huge number of steps, there is a lift in the Metro station just to the left. Definitely try to get to the top, as the views are incredible! 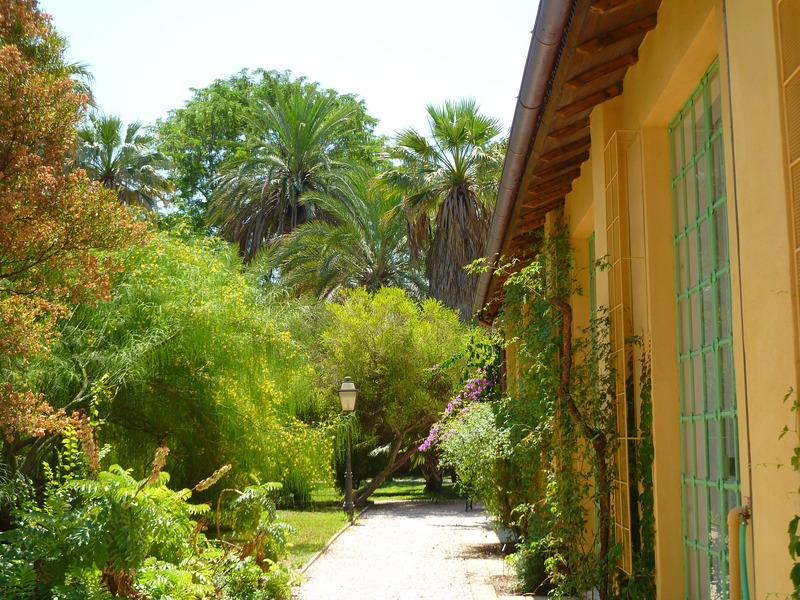 If you’re in the mood for some history, pay a visit to the Keats-Shelley House, to the right of the Steps. This was the house in which the poet Keats spent his final days, and his former bedroom offers a view of the Steps which has changed very little since the time of the Grand Tourists. I’m a huge fan of the Tomb of Eurysaces. I first encountered it in books as a classical archaeology student, when I studied it in some depth and it became one of the topics I felt most at ease answering questions on in the dreaded Exam Schools. I remember my first glimpse of it, from the Leonardo Express going into Termini from the airport – and then seeing it up close on the British School at Rome summer school. For me it’s one of those landmarks like the Eiffel Tower or the Athenian Acropolis, which you see so often in books and then can’t believe you’re seeing in real life. Except that it seems to be only classical archaeologists who have heard of it! Disclaimer: everything that follows is from my memory! So if any of my former tutors happen to be reading this then I apologise if I haven’t done it justice ;-). The Tomb of Eurysaces, though easily visible from the airport train, is relatively off the beaten track, at the Porta Maggiore – about ten minutes’ walk from Piazza Vittorio Emanuele II. The locality is dominated by the imposing remains of a Roman aqueduct (or two aqueducts to be precise, one on top of the other). The tomb is late Republican, thought to date to sometime between around 50-20BC, and the aqueduct was built later (under Claudius). Visiting the monument today, you can see just how close the tomb is to the aqueduct, which suggests that the aqueduct’s engineers and architects were sufficiently impressed with the Baker’s tomb that they built around it. Eurysaces himself was a freedman, and the fact that he was a baker is made abundantly apparent by his impressive and wholly unique tomb. Not only does its inscription identify him as a baker and contractor (the final word of the inscription, the word “Apparet”, translates “as is obvious”, implying obvious from the appearance of the tomb, according to my tutor), but there is a wonderful frieze showing the bread-making process around the top. Furthermore, the strange form of the tomb itself is thought by some to depict machinery used to make bread. I don’t think anybody really knows exactly what it represents (there are several theories), but an idea I like is that it represents a dough-kneading machine. There are rusty patches in the sockets of the prominent holes on the side, suggesting that there might once have been attachments – perhaps the arms which would have worked the machine. If this is indeed what it represents, it would show off the up-to-the-minute technology employed by Eurysaces, portraying him as wealthy (being able to afford brand new technology), successful (being contracted to produce the bread in such quantities as would demand such a machine) and progressive (this kind of machinery would have been a new invention at the time). Among other theories, it has also been suggested that the holes correspond to the size of a unit of grain, by which Eurysaces meant to demonstrate the importance of his bakery to the city. The tomb is also very useful to archaeologists because its frieze shows organisation of production, indicating that industrial-scale production was taking place in the ancient world. Moses Finley had argued, among other things, that this did not happen, but we see in the frieze several different groups of slaves who are each specialising in different stages of the bread-making process. This is the level of organisation which would have been required to produce bread (or any other commodity) in industrial-scale quantities. As well as telling us about the great demand for bread in Rome, this means that Finley was wrong, and the tomb is part of an ever-growing body of evidence which contradicts his arguments and which shows the sophistication of the Roman economy, which had previously been understated. The point to take away from the monument, though, is that here is a man demonstrating how dramatically his status has changed since he was freed from slavery. This is a common theme in freedman funerary art; we often see freedman depicted on their tombs clearly wearing togas (which were reserved for Roman citizens, i.e. slaves wouldn’t have worn them), or clasping the hand of their wife in the gesture indicating marriage (another privilege of the free). There are other examples of bakery equipment on graves, such as a flour-grinding mill on a tomb at the Isola Sacra necropolis near Ostia, but Eurysaces took the idea to a whole new level. Baking was how he made his fortune, and so it is how he wanted people to remember him. He was clearly a wealthy and successful man, to have built such an impressive tomb – which just goes to show that upward social mobility was every bit as possible in ancient Rome as it is today.